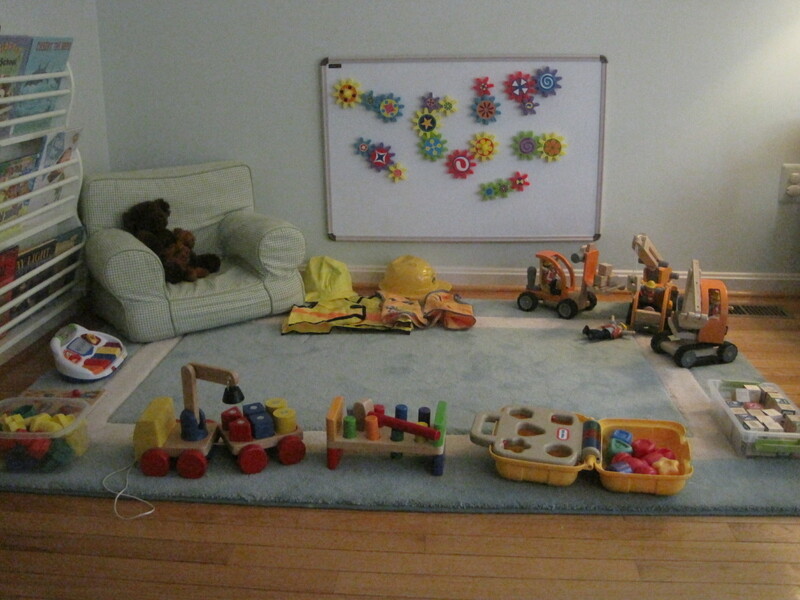 Dry-erase boards can make inexpensive and fun play-spaces. They encourage independent and collaborative thinking as well as facilitate conversation between adults and children. The number of positive words spoken per day in the home is positively correlated with intelligence in young children, according to recent research. Simply stated, the more words, the higher the IQ. See the picture below for an example of one we use in our home. Choose a location that is close to the ground as pictured above. Small children should be able to easily reach the board while sitting and standing. Magnetic clips are a must have, as they allow you to change the look of the board in seconds. 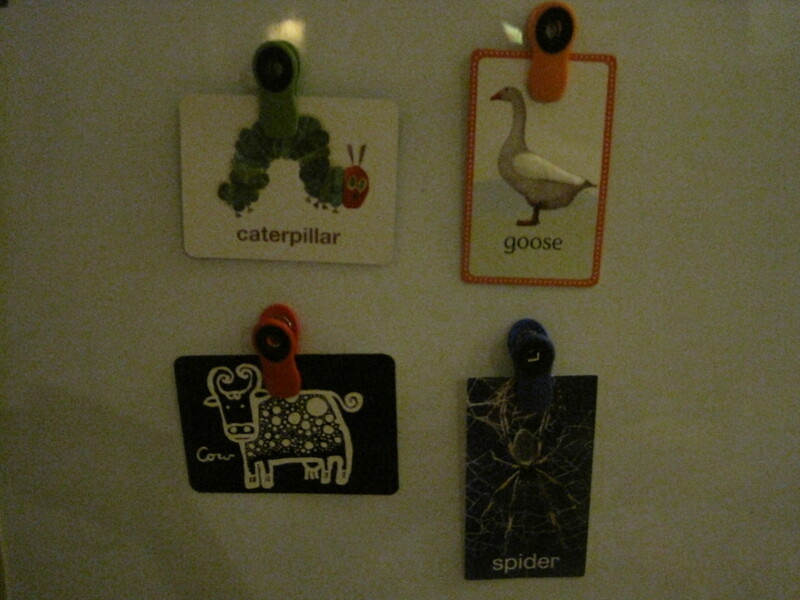 (See picture above for example of magnetic clips hanging a flash card). Be sure the clips have very strong magnets, as weak magnets will slip down the board when heavier card-stock is clipped to them. For an inexpensive way to display pictures and words: find pictures of family, friends, scenes and people from magazines, etc…; glue them to cardstock paper; and then laminate them at an office supply store. Babies naturally enjoy studying faces. Pick happy, sad, scared, surprised, etc… people and deepen your child’s emotional IQ with discussing why they feel might this way. You can talk about grandma and grandpa, mountains, blue sky, orange fish, etc… For a quick and easy way to display pictures, plenty of companies make baby flash cards. Keep in mind an Intelligent Nest doesn’t use flash cards to quiz or train babies, rather they are used as conversation starters. Children’s time is better spent engaging in conversation than memorizing before the age of 5. Ask your children obvious and insightful questions without expecting the “right” answer. Let children lead the conversation and encourage them with positive visual and vocal feedback. Here are a couple of recommended brands: Wee Gallery Art Cards for Baby (bottom left)– feature double-sided, adorable black and white images that infants LOVE to stare at ; My First Touch and Feel Picture Cards (top right)- children love touching and talking about these cards, plus the box that comes with them is fun to use; Baby Einstein Discovery Cards (bottom right)- gorgeous photography for parent and baby alike; Eric Carle Animal ABC Flash Cards (top left)- beautiful, double sided art cards with recognizable characters from Eric Carle’s literature. Child-safe shape magnets are the next go-to activity. I would start with a set of gears (Lakeshore Learning sells a great set). Toddlers will start to learn about cause and effect as they connect gears to create systems of energy. Infants enjoy watching the gears spin and blend colors. 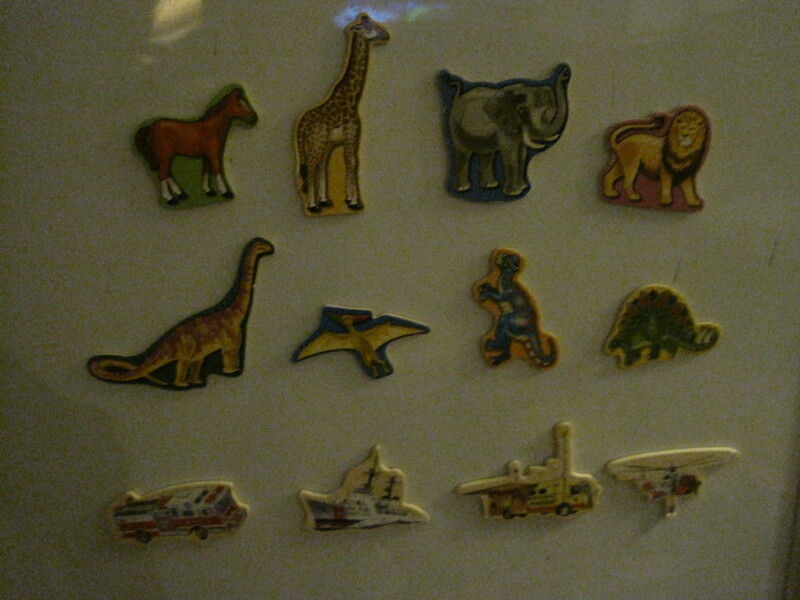 You can find fun magnets with themes that your child enjoys: trucks, fish, farm animals, etc… Melissa and Doug make sets of these (go through and pull out the pieces that look too small and put them aside for coming years if you have children younger than 3). Some educational supply companies make shape magnets with foam (usually called magnetic “counters”)- great for counting and sorting by color or shape. 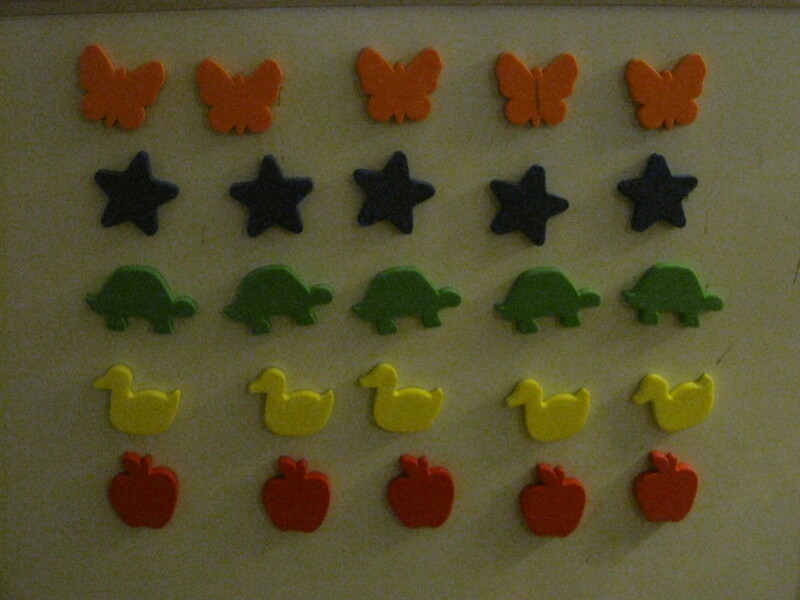 Lakeshore Learning makes a fun set with apples, butterflies, ducks, stars and turtles. It is large so you could split it in half with a friend to save money. Also, the household favorite: ABCs and 123s. 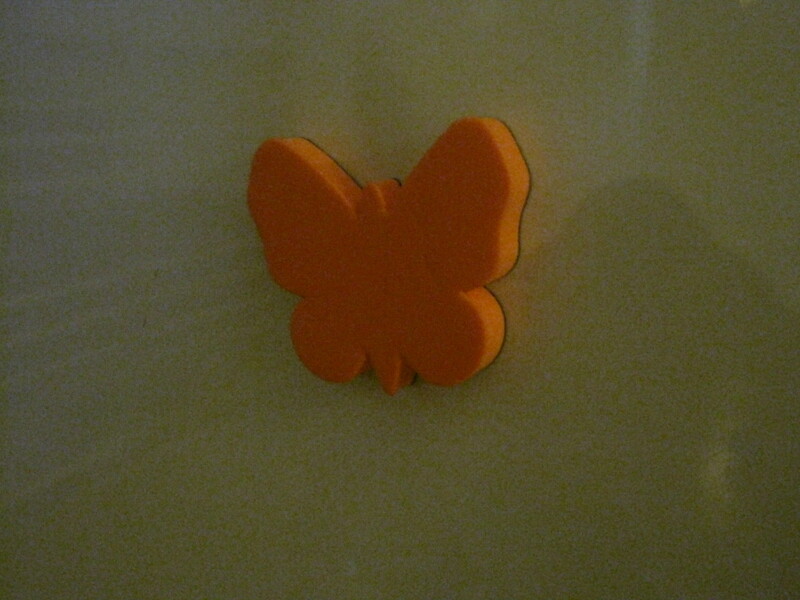 These magnets are often plastic shapes with strips of magnet behind. 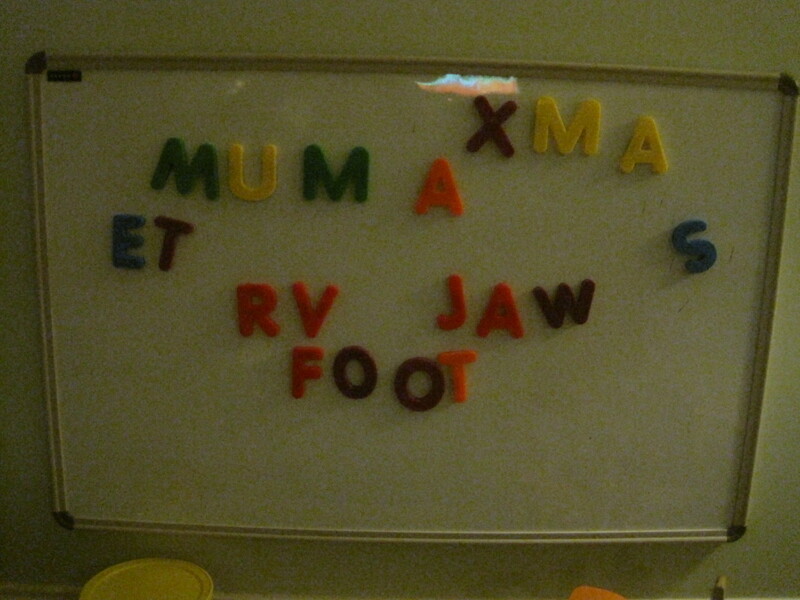 Kids love to “spell words” by placing a large series of these on the board, or hunt for letters that they know. Buy upper and lower case letters, but start with upper case. Numbers can be used as well, but are not as interesting to children until the age of 3 or 4. 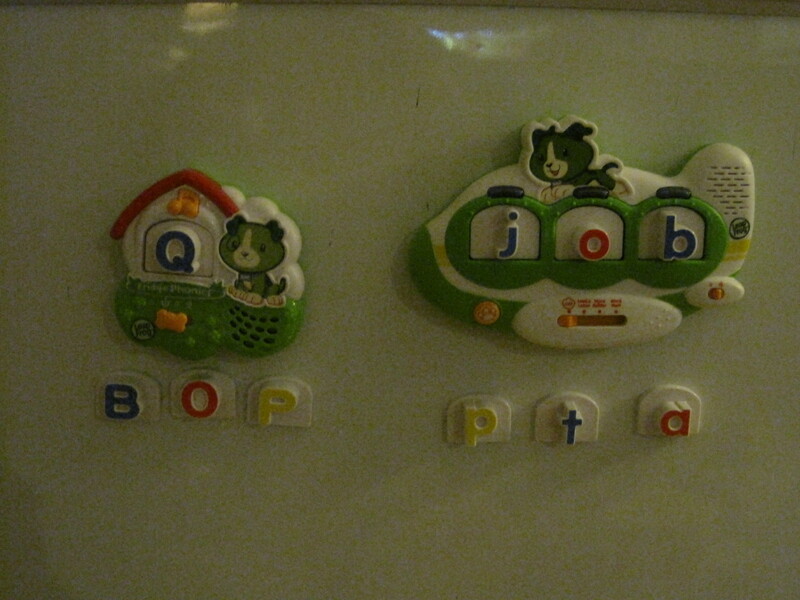 Finally, Leap Frog makes fun magnet activities with letters, shapes and sounds called “Leap Frog Fridge.” Generally, I do not recommend Leap Frog products because I think they are overstimulating, have a quick burnout rate, and do not promote free-flowing creativity, but the Fridge Phonics and Fridge Word Builder are decent, I would avoid the other Leap Frog Fridge products because the educational value per dollar is very low. Dry-erase board crayons- Crayola makes a set that comes with a hand-mit that erases the crayon. It takes some elbow grease and I prefer to use a paper towel with glass cleaner instead. The grease board crayons are beloved by children. 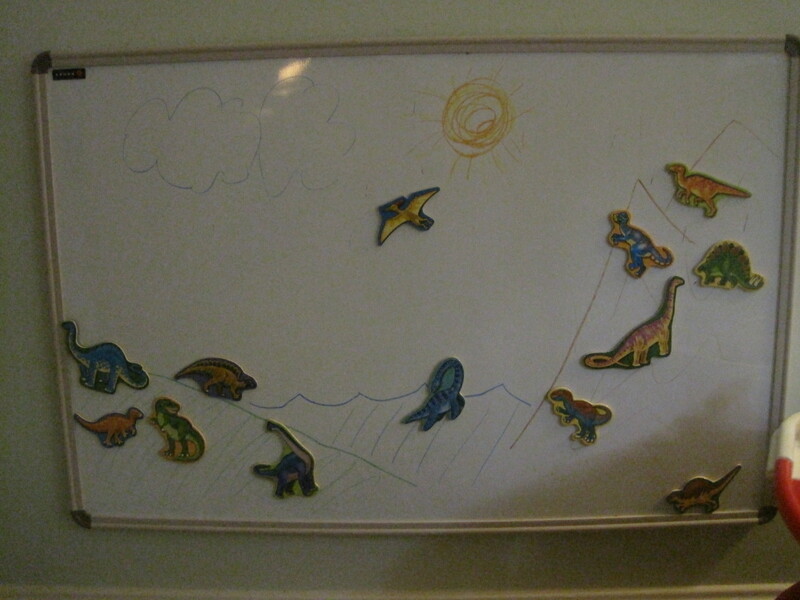 They love to set up scenes for the magnetic animals or trucks. They like to draw shapes and practice colors. They love having the power to do an activity typically reserved for adults- draw on the board. You can also create graphs, columns, and calendars as children age and mix your other magnetic board activities with the grease board crayons. Store all your dry-erase board activities in a tupperware so that you have easy access to all your options when you want to rotate. Keep the tupperware out of sight of the children so that they have a chance to forget about old activities, but still close enough to the dry-erase board learning center so that you will be motivated to rotate the board’s activities. Aim to change the dry-erase board once a week. 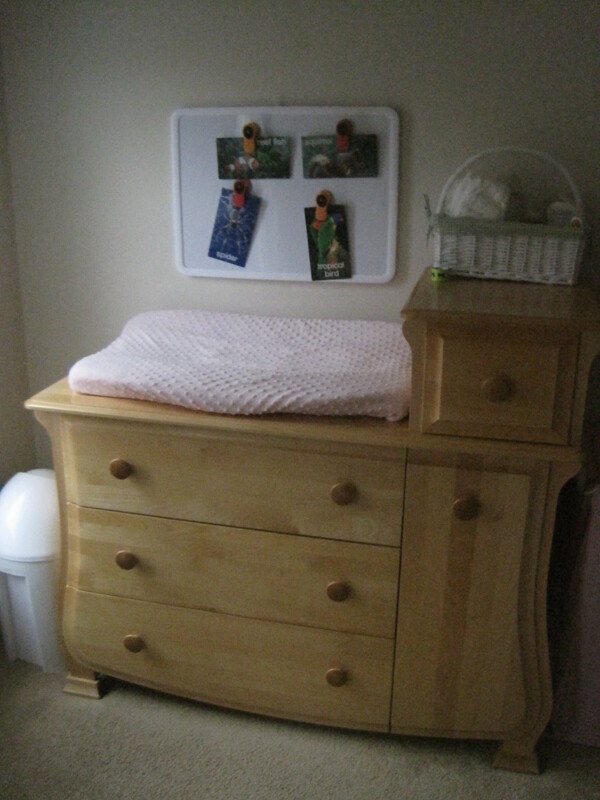 Dry-erase boards near the diaper changing station can be refreshed daily by the children during changes. They love having the responsibility and power to impact their own environment. Use themes if you have the motivation and energy. Meaning, if you have out farm toys one week, ask your child what can be put or drawn on the board to coordinate with “farm week”. Or just rotate through activities. You’ll quickly discover which ones your children prefer most. 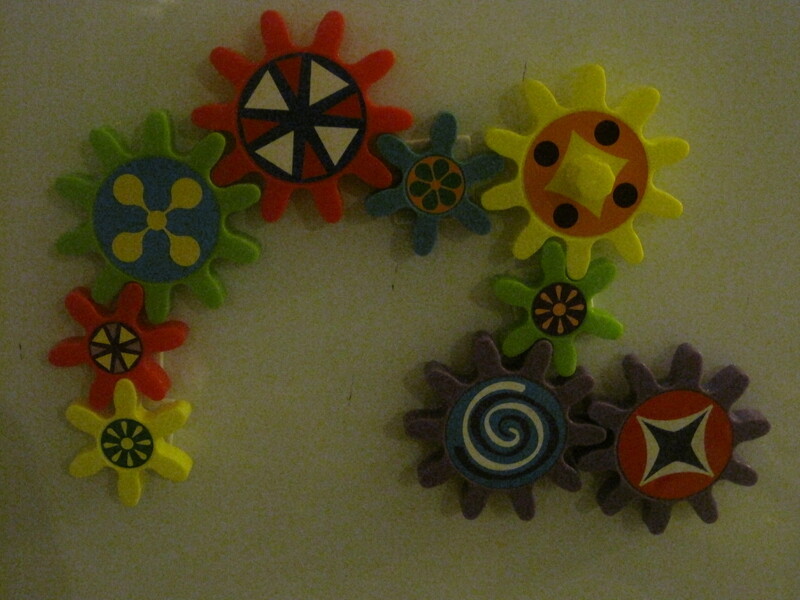 The magnetic gears are the biggest hit at our house. Have fun and let me know if you think of other great ways to use your dry erase board! Amazon sells most of the products listed in this article, but please let me know if you have trouble locating a product. I am happy to help. Enjoy!! Awesome ideas! We use the magnetic numbers on our dry erase board for our son, but I will definitely start doing some of the other things you talk about, especially the facial expressions! I’ve been working on those with my son, so laminating pictures of different ones is a great idea!